I am smiling wider than usual, the sense of satisfaction with one’s own creation, especially when only a few months back one was such a novice. Well, if you feel related to my ecstasy and the intense visual appeal of this cake matches the level that you want your Christmas cake to be, please do try it. Its got all the red, white and yet the simplicity of flavours that can easily win you some accolades. 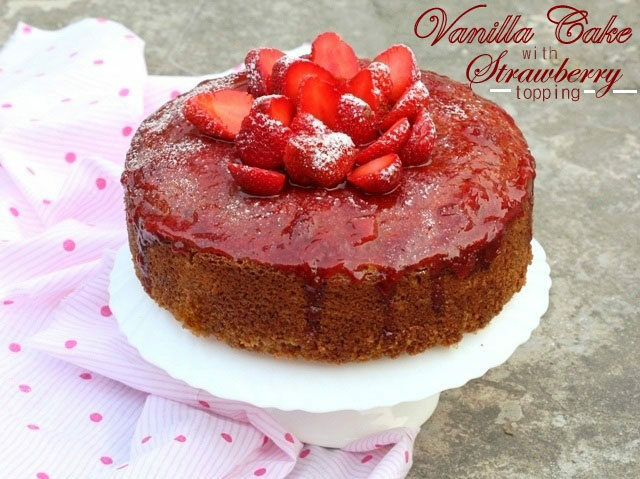 Okay, lemme snap out of being a romantic and tell you it’s a simple vanilla cake that’s been moistened with strawberry infused syrup instead of a plain one, and topped with some fresh strawberries with the icing sugar snow-fall on top. 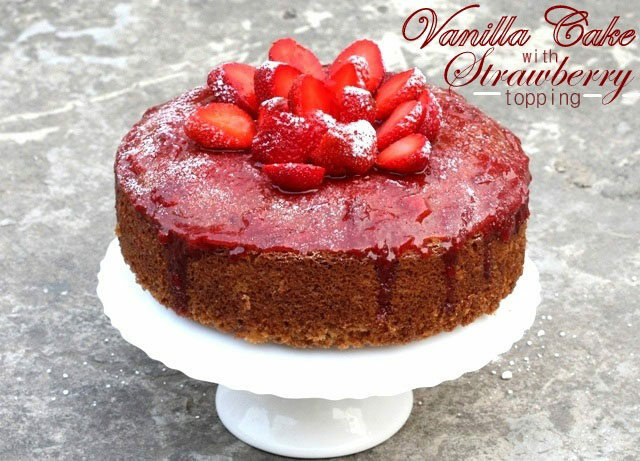 Simplicity with elegance, that’s my Vanilla cake with Strawberry topping. Preheat the oven to 180OC mark and grease an 8” cake mould. First sieve the flour, salt and bicarbonate of soda together in a mixing bowl and keep aside. 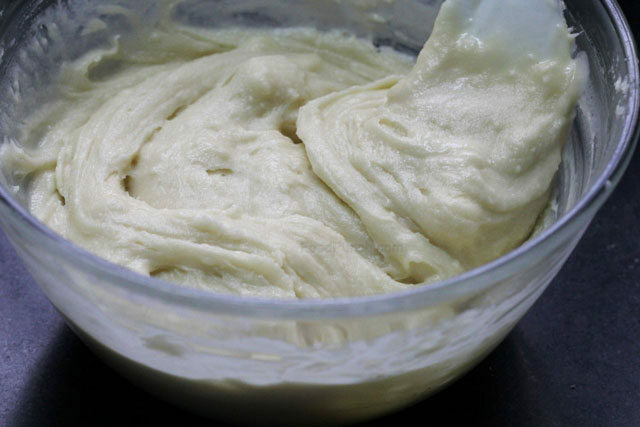 Then cream eggs, sugar and butter together in and electric blender or using a handheld whip until it is smooth and well combined. 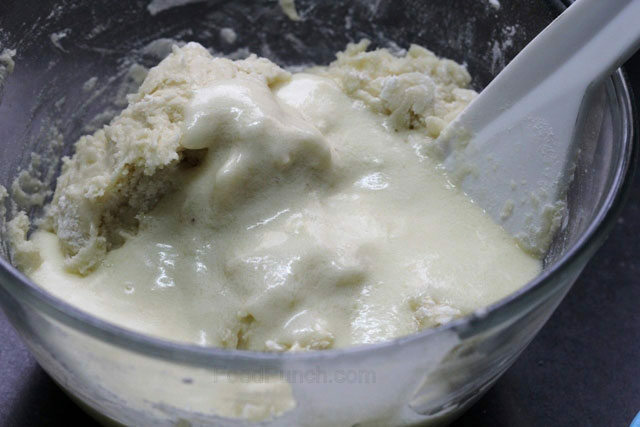 Now add the eggs mixture to the flour in to batch and just fold lightly with a spatula until they are just combined. Bake at 180OC for 45 mins in the centre of the oven or until a flat knife comes clean through the centre. Leave to rest in the oven for 20-25 mins. 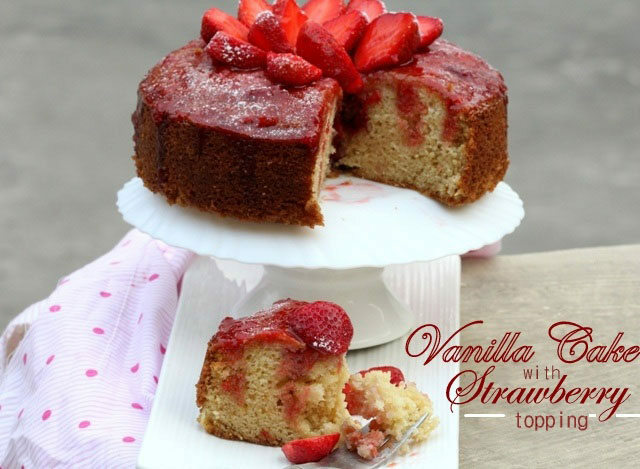 While the cake bakes, cut one half of the strawberries into half and chop up the other half. 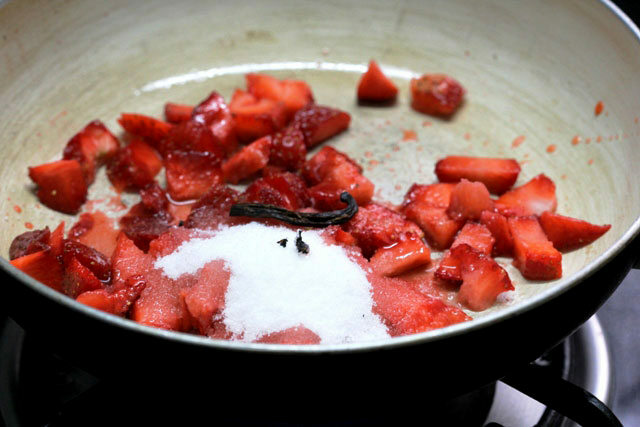 In a pan add the chopped strawberries, water, entire castor and crystal sugar, scrap out the vanilla seeds and add along with the pod and bring to a quick boil. 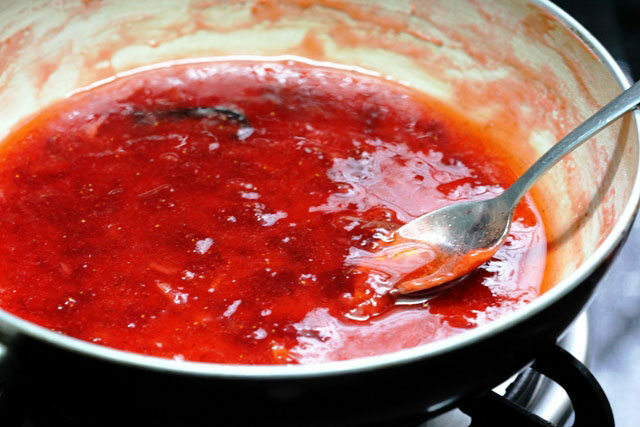 Then add lemon juice and allow simmering for 2-3 mins, continuously smashing the strawberries down with the back of the spoon. Turn off the heat and discard the vanilla pod. 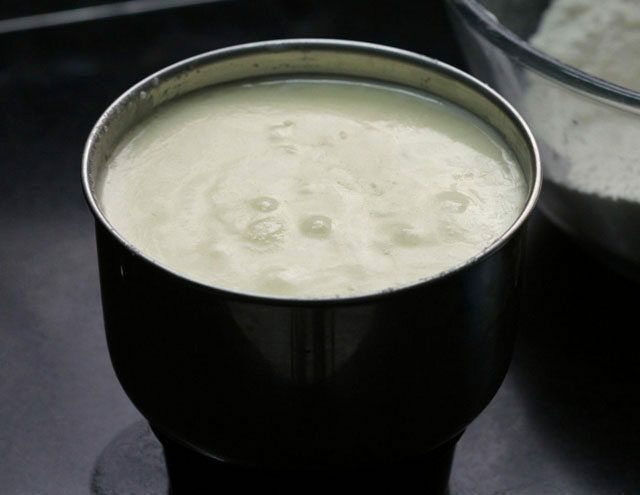 It will thicken as it cools, keep the consistency thick and just slightly flowing. 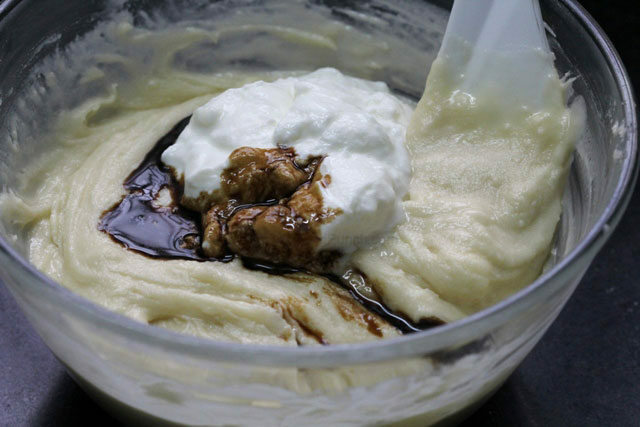 You may run through a blender or sieve for a smother consistency but that’s really not required. 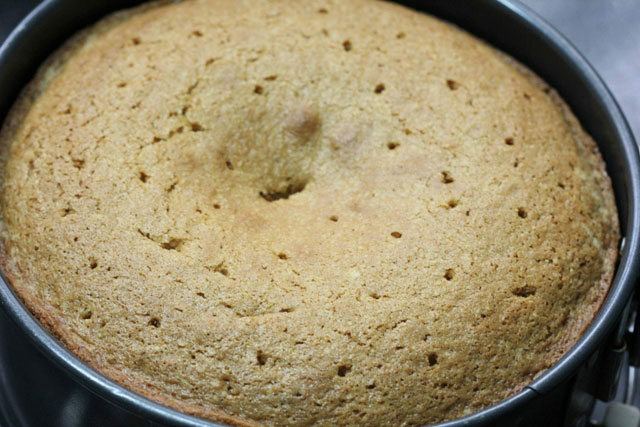 Once the cake is cooled prick holes through the entire depth of the cake using a thin skewer or toothpick. 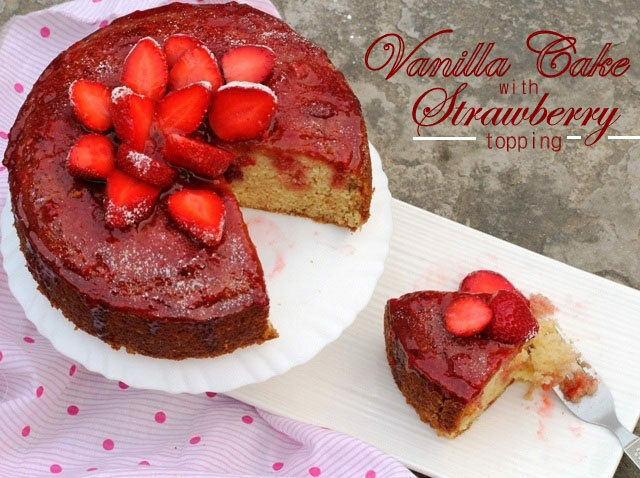 Now gradually pour a little strawberry syrup over the cake allowing a little time to soak in between, and at the end spread the remaining syrup on top. 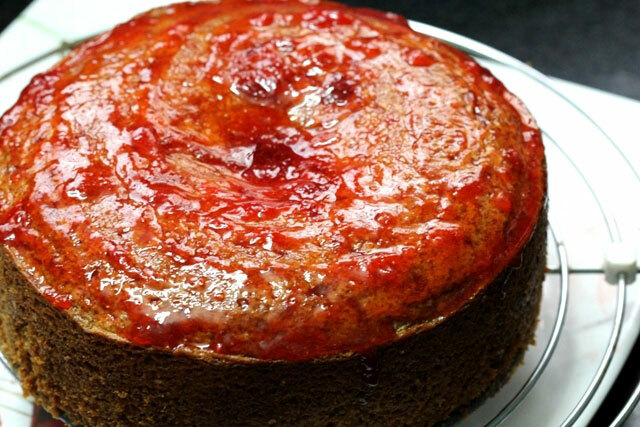 Finally arrange the halved strawberries on the top and put the icing sugar in a small sieve and dust on the top of strawberries and the entire cake. Wrap tightly with a cling film and keep in the fridge upto a week. 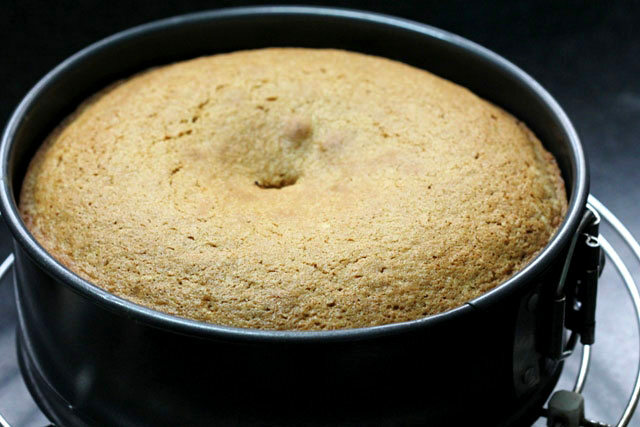 So, make this well in advance for that Christmas treat. 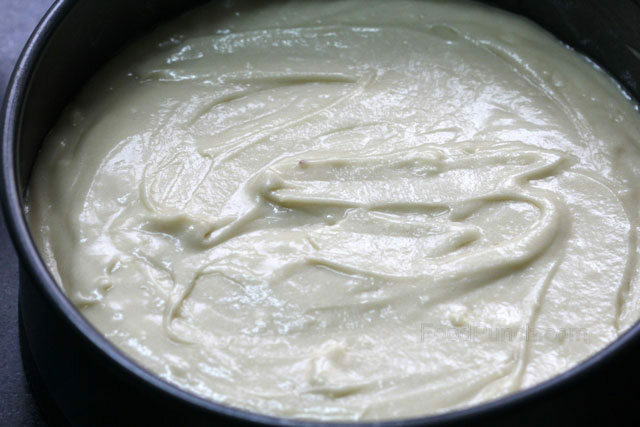 Remember the rule with cakes, just fold the cake batter together and do not whip to a smooth consistency for a good rising. wow!! looks very tempting dear!! fell in love with your step by step pictures too..they are epic!! Hi Suja, thanks a lot for your awesome comment.. And welcome to foodpunch :).